The Generate number block will generate whole or decimal numbers within a minimum and maximum range, optionally only using odd or even values. See the Drive data with Excel lesson for examples on how to use the Generate number block. The green input connector in the header is used to trigger the block to start executing and generate one new number value. The green output connector in the header triggers when the number has been generated. The title of the block (“Generate number”) can be changed by double-clicking on it and typing in a new title. The minimum inclusive number to generate. The maximum inclusive number to generate. 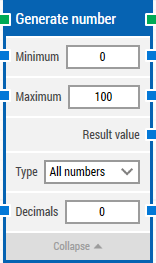 Select whether to generate even numbers, odd numbers or both. Specify the number of decimals (digits) to round the random value to. The default is 0, which means the numbers will be integers.